Max Volume Plus Mascara is the first product I tried by Wet n Wild. And to know my impressions of it, just keep on reading The price was about $5. The product is in a vibrant pink tube of a difficult to make out shape. For me it looks like a solid piece of metal. My review of Wet n Wild Max Volume Plus mascara. Price: $5 The tube is bright and oval shaped. It’s my first mascara by this brand, for a reference. I appreciate the brush wand very much. It’s big, silicone and tapered. + this mascara doesn’t stain my eyelids! 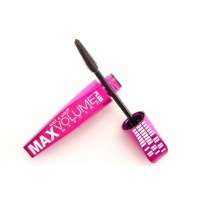 MAX VOLUME PLUS MASCARA by a popular Wet n Wild brand. Does it really provide as much of volume as promises? Hi! Today my review is dedicated to mascara. Recently I bought Wet n Wild MAX VOLUME PLUS MASCARA and I want to share my thoughts about it. Packaging: The mascara is packed in a pink glossy tube, which looks (as well as costs) cheap. There are 8ml of the product inside. Wet n Wild Lash-O-Matic Fiber Extension Kit is a good option for those who hate falsies, but still want to get long lashes.